Spotted this nice specimen peaking up out of the sand where it had almost gotten buried by drifting sand, but no worries, this is a tough plant. The beach morningglory (Ipomoea imperati) is adapted to and grows on coastal dunes where it helps stabilize the sand. The sprawling "vines" often get buried and you only see the distinctive leaves showing, and in the case the flower bud was poking up just enough for the flower to open even if the base of the corolla tube was in the sand. This morningglory is found all along the SE coast of N. America, but the funny thing is that this plant really gets around, and the Phactor saw it first on a sandy coast in SE Asia! No idea of where it is actually native, where it started its travels from. This makes you assume it's dispersed by seawater, but not sure about this. Anyone? And if ever you want a photographic challenge, a white flower in strong sunlight in a highly reflective place (sand) is it. Fortunately my camera gives the photographer a lot of override latitude to correct the exposure and even still it took a couple of tries. Today promises to be a typical hot, humid Carolina low-lands' day. Back home the upper mid-west is sweltering, but the big difference is that here it's humid and there it's dry. In out particular area summer always brings hot days, but there have been summers when we've barely turned on the AC. But when you string together day after day of 90s and even the occasional 100 degree high, our weather is more like what you expect in Tulsa, and who wants to live in Tulsa? Unless some thunderstorm activity intervenes and waters our gardens, we expect to find some losses among the newly planted. One of the problems of doing everything ourselves, no one else knows when and where things are planted, and therefore a house-cat sitter has no idea what to do if you say "water the new Japanese yews". Actually the needs-water list is rather long this year, and just watering the potted/house plants is quite a chore, so our vacation may end up costing us more than we planned. Maybe we need to start a coop garden babysitting service because having someone who knows gardens and plants would make things much easier. Anybody part of such a thing? The intertubes have made this a much smaller world, and a long-time reader figured out that we were vacationing only about 10 miles apart. As a nice botanical gesture, she recommended that the Phactor visit Green Swamp. Somehow we did manage to get a couple of hours away from the family mob and have a look-see. None of the urban sophisticates comprising the rest of our family demonstrated even the least interest in tagging along to a swamp. Well, it was their loss. 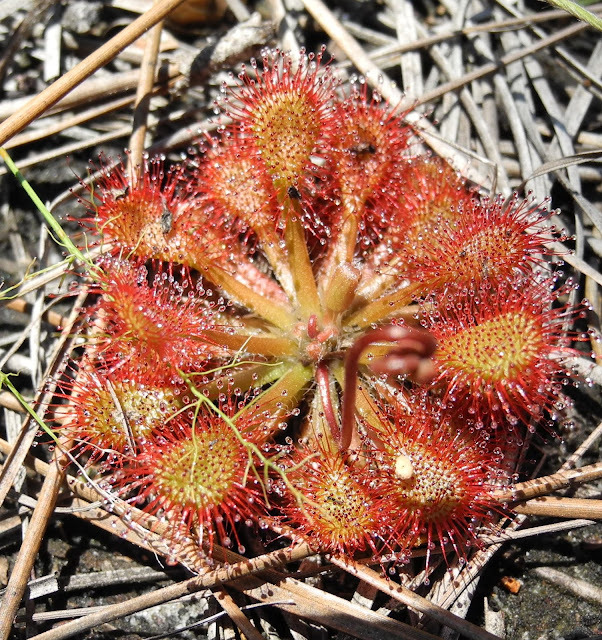 Even without knowing the area or having any guidance the Phactors managed to see sundews by the dozens (2 species it seemed, but haven't checked yet), showing off their glistening and deadly glandular hairs, bladderwort in flower, venus flytraps, and pitcher plants, all of which are "carnivorous" plants, trapping insects or other inverts for purposes of augmenting their nutrient supply. Nitrogen is generally hard to obtain in these wet acidic environments. The pitcher plants were past their prime, so see this blog post from our friendly tipster to see them a bit earlier in the season. Image-wise you'll have to make do with a sundew. There were also two milkworts, two Rhexias, a yellow-eyed grass (Xyris sp. ? ), and lots more in flower. The Carolina coastal region is quite famous for such plants, some of which are endangered because of habitat destruction and human predation. This NC beach is composed of very fine sugar sand, which when properly wet packs tightly and it can be sculpted in considerable detail. Here's a fine example for what is obviously a first effort. With some practice this fellow will probably get pretty good at making sand sculptures. Sort of made you start looking around for little tiny hobbits. In general, algae adapted to coastal environments by anchoring are called seaweeds. Here's an exception, a seaweed that re-adapted to the open ocean by becoming free-floating again, Sargassum. The Phactor doesn't know his seaweeds well enough to know for certain, but clonal clumps of this algae get picked up by the Gulf Stream and then transported north from the Sargasso Sea to the coast of North America where it washes up on the beach. You can see the flotation devices, pnematocysts. For some reason most "young" people don't know the term pneumatic although it used to refer to your car or bicycle tires meaning they were inflated with air. Even less well-known among today's college students is that pneumato- starts with a p. Cyst is the cell or structure that is inflated. It's no wonder such terms are just a puzzlement. This little clump looks really fresh because it it was just after high tide and very early in the morning, early enough that the beach was still nice (vacant). One of the horrible, terrible, very-bad, no-good things about writing a book is that the scientific publishing never stops, and it takes a lot longer to get a book published than to get a scientific paper published, although sometimes it doesn't seem so. So what you really, really hate is when while putting the finishing touches on a book manuscript an article gets published that you now must, yes, must, incorporate into your book, and so it is that an otherwise nice morning scan through a bunch of science blogs results in annoyance. So here's the short version, because the long version isn't available to you. Most of these findings are not really a surprise, more of a confirmation of what was known, but very nicely summarized in terms of character evolution. Hornworts have the most ancient common ancestry with the rest of land plants. Sporophytes invented stomates, once it would seem. and the innovation of apical growth and apical branching produced sporophytes with 2 or more sporangia on bigger sporophytes, and then plants really got a lot bigger. It would appear that this study will provide some conclusions that are more specific than previous studies. Otherwise the Phactor had it pretty much right about what led to vascular land plants. Yes, the Phactor is posting his Friday Fabulous flower a day early because a glance at tomorrow's schedule suggests he might not get to it otherwise. In fact for the next week or so, posting might be a bit spotty. One of the reasons that the Phactors threw their money into a hole and had their 90 year old pond refurbished was so it would be a better habitat for waterlilies (Nymphaea). For several reasons, primarily competition from a sacred lotus, now caged to prevent more nasty interactions, well before our pond was redone, our waterlilies had died. So late last season waterlilies came back to the lily pond, and it was either that of change its name. 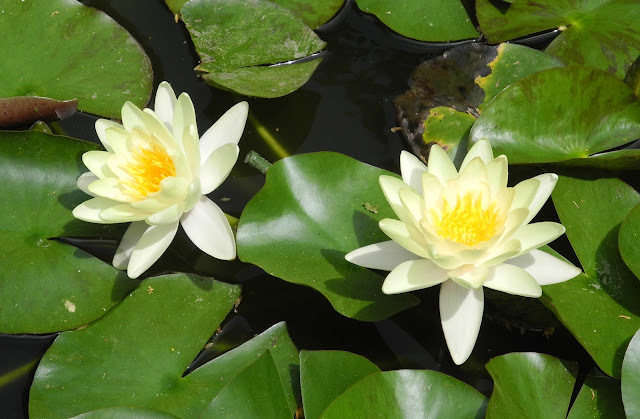 And now they are responding with some colorful displays, at least as colorful as our hardy waterlilies get (creamy white, yellow, pink), and it's nice some plants like the hot weather. They are really a lovely flower, one of those flowers where there are lots of floral parts and no sharp demarcations between floral parts that you would want to call sepals, petals, stamens, and pistils; they just grade from one into the next. You don't see that outside the basal lineages or magnolids. And that's the other reason for having waterlilies; they are an ancient and basal lineage of flowering plants as strange as that may seem. The Phactor took one look at this book title, and all that came to mind was Up in Smoke, the 1978 stoner film with Cheech and Chong. After all when you publish a book titled: Uses and Abuses of Plant-Derived Smoke, what else would you think? Well, actually lots of things, for example, incense. Remember frankincense and myrrh were considered very valuable commodities in Biblical times. And of course, delivering prayers or other messages by smoke, par fume, gave us the word perfume. A colleague smoked rather cheap cigars because they kept insects, and everyone else, away, but many insect repellents are delivered via smoke. Or the time the Phactor threw a huge arm load of green "ditch weed" (fiber race) on a campfire to dispose of it, and pretty soon an aromatic smoke covered a whole campground with the smell of burning hemp. Take that mosquitoes! On one hand, this sounds like a fun, informative, if not rather esoteric book, but the last thing the Phactor needs is more ethnobotanical lecture material. The most esoteric thing in my files: an entire treatise on tooth sticks of the world. HT to AoBBlog. Without question the nerdiest cartoon of all is xkcd. If you do not know this cartoon, then you have no nerdy tendencies at all, and don't act like this is a good thing. This particular one, a cartoon of all known exoplanets is pretty spectacularly nerdy even for xkcd. Took me a second to realize there was a "you are here" component just lacking the red arrow. And to draw them all to scale. How nerdy is that? Knowing how many exoplanets we know about is pretty nerdy too. Crap, that means updating a line in a book chapter, and how doyou cite a cartoon? It takes a very special mind to think of this stuff, and then to make it funny. Botanists end up searching the web for some pretty esoteric items, certainly not the mainstream of web use, so in the totality of their helpfulness, search engines deliver some odd items from time to time. It's almost as if they were right out of the Hitchhiker's Guide to the Universe, where some helpful cybernetics delivers you what it thinks you want. My first really funny results involved a search for holly just using the common name rather than the genus Ilex. Now that was just a dumb thing to do. But today the Phactor was interested in the Devonian fossil plant named Horneophyton. Now how can this go wrong? Ah, but maybe your Engrish isn't so good, so the cybernetics decides to try to sort out some character strings. Ah, you horneo (horny old? ), guy? Maybe you need some help? But this did come as a complete surprise. Sort of stands out among the humdrum of regular old paleobotany illustrations. So the old search engine certainly covered all its bases, giving me everything that could conceivably be found under that heading. How funny. Here's two images, you decide which one the Phactor was looking for and which was the surprise. Ah, both do exhibit some dichotomous axes. As if our job could get any harder, the state of Misery is trying hard to stop education altogether. Let's see what this legislation allows or requires. "students may express their beliefs about religion in written and oral assignments free from discrimination based on the religious content of their work; that no student shall be compelled to perform or participate in academic assignments or educational presentations that violate his or her religious beliefs". What a crock! Yes, folks, in certain parts of these United States, you will never have to confront or deal with any uncomfortable ideas or information conflicting with your beliefs. This is truly remarkable. Imagine that, you never, ever have to hear anything, or learn anything, of deal with anything that doesn’t fit into your particular belief system! If you ever wonder what is wrong with higher education, what will finally be the death of higher education, this is the kind of complete crap that will do it. No one has to learn anything they don't want to. Oh, does someone believe in a flat Earth? How about tooth fairies? How about a medical student who thinks a witch's curse is the actual problem? Now the Phactor has been explaining evolution to students for quite a few decades now. But he’s never required that anybody believe anything. However it is required that you demonstrate that you understand what was explained to you. So this is total anti-educational BS. You don’t have to learn anything. You can write an essay about the garden of Eden, which according to Mormon theology might be in Misery, instead of organic evolution, and what then do professors do with such stuff? So what would such legislative crap allow or disallow? It boggles the mind. What are your thoughts? The F1 stopped by to give the Phactor a decent bottle of bourbon, and it is much appreciated. Really good bourbons are out of her budget, but they're sort of out of my price range too. 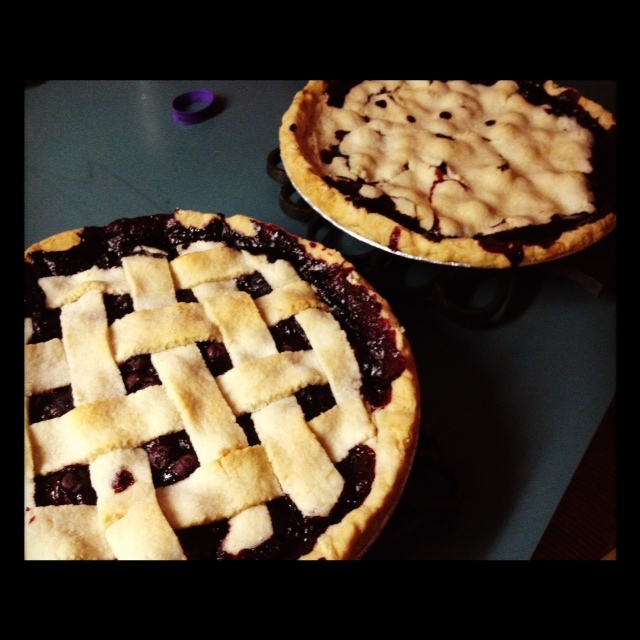 It was very thoughtful, and a bit old fashioned (pun). A bit later Komi called, a foreign student from years ago, but as loyal as a hound dog, to wish the Phactor well. This was from a time when we had a monopoly on students from the 4-lettered African countries: Togo, Chad, Mali. It was good to hear from him. More recently we've had two German graduate students living with us, sequentially, for about 2.5 months each, both charming in their own way. And this is one of the great things about working at a university, interacting with students, especially foreign students who need generous people like us. It has never struck me as fathering, my interaction with foreign students, but it has been quite rewarding as a sort of mentor. And the F1 has made us very proud by being very welcoming to these interlopers, these surrogates, giving them a younger view of life in the USA, to the point of really befriending a couple of them. In fact in combination, our influence on one of the recent visiting borders resulted in several interesting reactions: 1. spiced pecans were a huge hit, as they have been with many others, and 2. her Father got a gift of bourbon (curiously the same brand the Phactor just received). It's not the same, it's not really fathering, but how nice of them to just remember that you helped them out, and taught them a little something. Yes, today is when Father's get to calculate their Darwinian fitness, which is how many copies of your genes you've passed on to the next generation. With only one F1 the Phactor has an obvious DF of 0.5. However it's not actually that simple. You see the Phactor on average shares a 0.5 genetic heritage with each of his sisters, so on average 0.25 of my genes were passed on to each of their six offspring. Wow! Thanks to my sisters my DF has gone up to 2.0. Now things start to get a lot trickier. As yet, none of us are grandparents. But our parents each had siblings with whom they shared a 50% genetic heritage. And they had children, cousins. Of course your parents also had cousins who had kids too. So again a fraction of each of their genes are shared by the Phactor, but now the math is getting to the point where without another cup of coffee no attempt will be made to figure this out. So there you have it. Happy Father's Day. You have a DF of at least 0.5. Although everything is pretty thristy right about now (our area of the upper midwest is dry, dry, dry), the mild winter and early spring were to a few plants liking. Never before have the hydrangeas looked so good. And take if from the Phactor, this is unusual. Hydrangeas don't like it here very much; our soil is too heavy and not acid enough, and our summers are too hot and dry. The hot dry part has just arrived with June, about a month early, but until now the hydrangeas have just been great. Several 'Endless Summer' hydrangeas clustered in the front garden have been stopping traffic of all sorts. Even a snowbell hydrangea that got eaten off by rabbits over the winter has produced a big display. Here's one of the less gaudy ones, a purple lacecap (Hydrangea serrata 'bluebird') and it's never looked like anything before, so it was on the short list of perform or get replaced. This year will get it a reprieve although not a pardon. In this area hydrangeas tend to the pink end of the spectrum (high pH), but application of fertilizer for acid-loving plants has shifted flower colors to blue, so they are looking pretty good for this reason too. Circumstances well beyond the control of the Phactor have placed the academic prestige of our institution in jeopardy. Yes, we have suffered fiscal cuts at so many levels, and at a certain level, the academic prestige of the entire USA's higher education system is in jeopardy. You cannot withdraw support from higher education for three decades and it not have some negative impact. Yes, yes, fiscal matters are important, but what looms larger, a matter of much greater significance, is that our institution has no ice cream available in the student union! Sorry, but no institution of higher learning without ice cream amounts to a damn thing. Naturally the Phactor brought this matter to the attention of our President who opined that Ben & Jerry's would be just the thing. Now if some significant action isn't taken, then he's become part of the problem rather than being part of the solution. A previous attempt to placate the Phactor involved a substance called "frozen yogurt", and having sampled it, pronounced it non-ice cream. As predicted not enough of this substance was sold to make the enterprise successful, and the people of little imagination who manage our student center have determined that such tenants are not viable. Another way of looking at this is that they charge too bloody much rent for a small business whose customers inexplicably disappear at the end of every semester. So now just before new students and family show up for orientation, there is no ice cream and what are they to think? What kind of institution have we selected? If your are a trustee of an institution of higher education, ask yourself, "Do you know whether there is ice cream in the student center?" Well? Do your job. Do something important. Get Ben. Get Jerry. Get Berry Garcia. Our botanical geek tour scheduled earlier this year, but planned way back in February, almost came too late to see flowering displays of azaleas and rhododendrons. This was no surprise by the time of the trip, but what are you going to do what with the airlines being so helpful about changing reservations. Of course an earlier trip was out of the question because of semester demands, so little did it matter, and while annoying, it wasn't a tragedy and we got to see some magnificent yellow wood trees in full bloom. However earlier flowering times as a result of global warming are a serious matter for some organisms. Hummingbirds winter in the tropics and then fly north to breed in our temperate zone summers. The advance on flowering dates is more pronounced at higher altitudes, and in places like the Rocky Mountains high meadows flowering begins on average 17 days earlier than 40 years ago. This means that when hummingbirds show up more or less on schedule, some of the hummingbird's flowers have already come and gone. And remember, this nectar is the food, the sustenance, for hummingbirds. How this will impact hummingbird breeding and migration is still not certain, but generally less food during your breeding season produces fewer offspring. Although the study was about the birds, without their hummingbird pollinators, the plant reproduction was probably negatively affected too. 17 days is a long time at higher altitudes. Could hummingbirds adjust? Yes, for example, if those birds who migrate earliest have the most offspring, then natural selection could shift the instinctual behavior of when to migrate to an earlier time. Other complications may exist like what is in flower and when along the migration route. For example, this year our columbines were done before any hummingbirds showed up, so if this flower were a "filling station" to gas up their tanks, they would have been SOL. Expect biologists to find many more examples as such trends continue. The Phactor has been really, really busy, and he hopes his editor notices the low frequency of blogging and understands that all that energy is being directed at finishing his book. In terms of solving the problems that stand between me and the completion of this tome, the Phactor feels like he has been playing a game of whack a mole. Progress is being made, but it seems so slow. So, here's something to tide you over, something classic, something wonderful, and if you don't know it by now, the Phactor is a huge fan of Sidney Bechet. If you don't know who this is, then you knowledge of American music is sadly deficient, but this will help: le petit fleur. So get yourself a nice old fashioned cocktail, preferably using orange bitters, and enjoy. A few months back the Phactors had to hire help to move some heavy bedroom furniture, so the local moving company sent over a team of gorillas. Typically enough they were relatively young and big guys. But one of them says, “You’ve got some really nice art, abstracts, and so nicely hung.” And in particular he was taken by one of the more sophisticated. Then the other one asks, “Wow, those are great bonsai trees you’ve got.” And then he begins discussing the why and wherefore of getting them started and the zen aesthetic. The zen aesthetic? From a couple of furniture movers? Well, why not? Now this one episode illustrates a point that seems to have gone missing from recent commentary regarding the value of higher education. The popular meme is that higher education just isn’t worth it in terms of getting a dollars and cents payback since the cost is so high and higher paying jobs remain quite limited. No question higher education has been good to the Phactor; he did manage to pay and work his way through and graduate with three degrees and no debt, and got a decent paying job as a result. But anyone who thinks higher education is just about how much money you’ll make, and a degree a ticket to a more lucrative job, is actually going to university for the wrong reason. You go to get educated. You go to learn a more sophisticated way to read, to write, to speak, and to think. And yes, this frequently leads to higher paying jobs and professions. But doesn’t higher education lead to an appreciation of many things you never ever would encounter if you had not had higher education? Art, music, literature, plays; none of them have had much impact on my professional career, but my appreciation of such culture has greatly enriched my life, and indeed, our art collection has grown to an impressive size although simple acquisitive accumulation was not at all our goal. One wonders if these critics of higher education’s value resented or lacked a basic “liberal arts” component to their education? Who could argue that a plumber would earn more money by having taken a philosophy course? But it may well make the plumber a more interesting member of our society. Maybe one who sees issues in more nuanced shades of gray and in less stark black and white terms? Given the simplistic, simple ideological thinking that abounds these days, two ideas strike me. One, maybe higher education hasn’t been doing such a good job. And two, maybe it’s in the best interests of ideologues to promote a less sophisticated, less intellectual citizenry who won’t see the logical problems and the insufficiencies of many arguments so easily. My two movers much improved my feeling about how things are going, but the news is so filled with examples of weak intellectual tea, one wonders what this means about our society as a whole. But with so many people denying what is known, with so many people relying on the inability of people to think critically, with so many people enamored with simple ideas and explanation, one wonders if a more intellectual public is what such people want at all? And in that case it serves the promoters of ignorance to argue that a higher education just isn’t worth it. How very unfortunate for all of us. Sometime back the Phactor bought a big pizza stone at a garage sale, and Mrs. Phactor wanted to know why we needed another pizza stone in addition to the one that lives in our oven. At any rate after languishing in our basement for a year or several, the idea of using it on a gas grill for cooking pizzas was prompted by some magazine cooking article. So the decision was made to try grill pizza as a summer experiment to not heat up the kitchen cooking, and it was so successful, a big hit with one and all. In particular people liked being able to build their own mini-pizzas to their own liking. Rather than using pizza sauce, the standard was a tomato-garlic topping with a variety of other goodies and spices, some standard, some not. At any rate, this is something you may wish to experiment with. Now do you suppose the Phactor will get a wood fired pizza oven for Father's Day? Well, a Begonia isn't very exotic, so it always comes as a surprise that so many people don't notice what they are looking at. Yes, flowers. But Begonia is a monoecious plant. Mono = one, ecious = house, so this means the plants usually, but not always, have both male and female (and yes, this is technically wrong) on the same plant (one house). What tricks people is what tricks pollinators too. The only obvious reward is pollen, and male flowers (center) have a cluster of yellow stamens that are pretty obvious against the light background of the perianth. But only one of these flowers has stamens. The others have a conspicuous yellow stigma presenting a very similar image. If pollen is the only reward, then the non-rewarding female flowers cruelly deceive the pollinators by mimicking the rewarding male flowers. This is called food-deception automimicry. The flowers are different in another very obvious way that many people also fail to notice; the females flowers have a prominent winged ovary below the perianth, and a similar structure is completely lacking on the male flowers. The ovary is sort of petalloid, and that may be the reason people don't notice. Since the summer is here, apply this lesson to your cucumbers and squashes. The Phactor was still on his first cup of coffee when Nate showed up to begin work on a combination stone/wood-henge pergola. It stands a bit behind the lily pond that we filled with money during its renovation last summer. And an college student seeking summer work of the strong back/weak mind sort just finished spreading ten or so cubic yards of mulch around our various gardens. Earlier the balcony off one of our bedrooms was refurbished so it is no longer dangerous to life and limb to sit our there. In re-landscaping the pond area, the local garden shops have done very well. Across the street a neighbor had his roof redone, and along with our neighbors some 200+ feet of good-neighbor wooden fencing will shortly be replaced. And the list goes on and on as not a day goes by that one or more tradesman trucks is parked on our block. Yes, folks. We're the job creators, or if not actually creators, the money from old house owners and gardeners is the life blood for all these businesses, oh, except for ChemicalLawn. They don't get a penny. Too bad the government doesn't get this. The middle class drives the economy of this country, and yet the aim seems to be to diminish their ability to consume. In the meantime corporations are sitting on top of record amounts of cash and are they building any pergolas or lily ponds? No! Their money is just being wasted by being money. Maybe like Scrooge McDuck they just like sitting there and looking at it. The Phactor prefers waterlilies. Once again the political brain trust of our fair state (Lincolnland) has figured out how to weasel out of a fiscal obligation. In this case what is likely to happen is that the state will place the responsibility for contributing "their" share of money to our pension fund upon the universities. Then they will crow about having cut costs and balanced the budget. But the cost did not go away; it just got shifted elsewhere, and in this case to the universities. Now this is nothing new. The state has been withdrawing support gradually over nearly 30 years, placing unfunded mandates upon the universities, and as a result of the state support dropping form about 68% to less than 23%, tuition has gone up. Transferring the cost of pensions will only make this situation more chronic. Our fine politicians will brag about not having raised taxes while they will have raised the cost of higher education for all future students and their families. If they do the same thing to school districts and community colleges, then property taxes will also go up, but since these are not levied by the state, that won't count. The simple point is that to pay for the state's obligations, taxes will have to go up, but lacking the political resolve to do the right thing, they will back out of the mess and leave it to everyone else to figure it out. Is it any better anywhere else? One of our students defended her master's thesis today, and it was a very impressive study designed to see if a plant parasite responds to a host plant under water stress like insect herbivores would respond. The parasite is an amazing organism, dodder, a fully parasitic vine in the morning glory family. It looks like yellow-gold silly string, and it can make some really impressive infestations. One of the hardest problems is keeping a single parasite on a single host, and in nature the vine can sprawl across numerous hosts and make hundreds of connections to the vascular tissues of the host plants. It turns out that dodder doesn't react like aphids or other herbivous insects, but it is a totally amazing organism none-the-less. Image courtesy of Silvae. The Phactors and friends went to a garden party, and a quite impressive garden it was much in keeping with the impressive house and impressive old neighborhood, one of those enclaves where the wealthy built their castles and lived very well in the late 1800s. A little of the old money still lives there, but most are now successful professionals in lucrative fields (that leaves out college faculty). So we toured the gardens, drink in hand, pinkie finger raised, and took in the very extensive and quite lovely plant collection, one of the nicest personal gardens the Phactor has seen, and there on the lowest level terrace, tucked into a southeasterly and very well protected corner was a southern magnolia (Magnolia grandiflora), and of course, they don't grow here in zone 5, although the Edith Brogue tree in New Jersey has survived -24F, and that would be a zone 4 temperature. Although cold hardy cultivars are known and the tree is cultivated further north than it's zone 8 native range in the southern half of the gulf coast states, the Phactor had not seen one successfully grown here in the harsh midwest. Some cultivars of the tougher sweet bay magnolia will manage to grow around here. 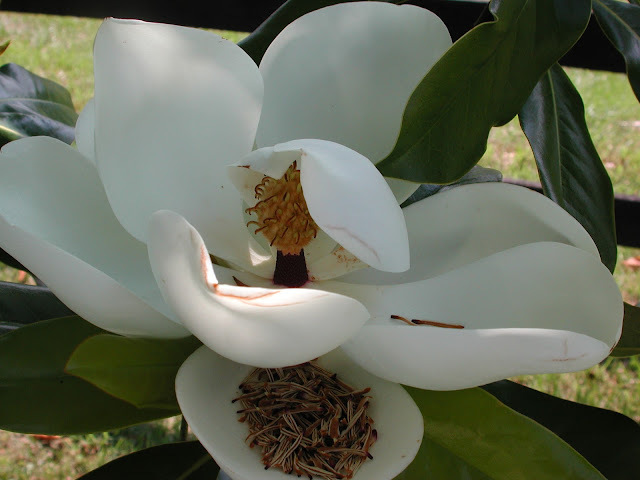 The flowers of the southern magnolia are so big and lovely, and the leaves so green and glossy, it's a beautiful tree, although Chi-town relatives transplanted to the south in retirement, where presumably their longing for deciduous trees (or just grass!) caused them to whine about the tough leaves and big cone-like fruits of a truly subtropical tree. So right there on the spot magnolia envy reared its ugly head, and this is bad because you should never covet another's garden. Part of the reason for this extraordinary plant growing where it cannot is what we call a microhabitat, some little bit of space that functions as a very different environment. In this case protected from the winds, next to massive walls that re-radiate heat, and a terrain that allows heavier, colder air to flow away, and you have the formula for success in growing a tender tree far from its home. Dang! Nothing to do but drown my envy in another white rum and tonic. First ever Fascination of Plants Day - 2 weeks ago! Yes, the first ever Fascination of Plants Day sounds really exciting, and fun, but we missed it by over 2 weeks (May 18), so it was pretty hard to get involved. Unless, unless some of you knew but just didn't tell us? Hmmm? And then there's the title. Plants are fascinated or fascinating? Shouldn’t it be fascination with plants day? Now the European Plant Science Society certainly has the right idea to celebrate plants, in English no less, so we won’t quibble prepositions. But how comes we just now finds out? Is someone a lot further out of the loop than ever imagined, or was this event a bit poorly promoted? After all isn’t that what the intertubes are for? And nobody on any of the many plant blogs picked up on this at all? How hard is it to reach out to the e-network of bloggers to promote a new event? We're easy to find. The Nature Blog Network keeps track of the traffic at about 2040 nature related blogs (The Phytophactor is ranked 8 under “flora” or plant related nature blogs), and it’s an international list. So while loaded with good intentions, everyone will have to wait almost a year for the second Fascination of Plants Day, if we remember, if we get reminded. Far out, man, a car made of hemp, but if memory serves the Phactor correctly, and not all of those years are remembered clearly, didn’t Cheech and Chong come up with this idea years ago? Will it be a worry if your car is smoking? Still hemp as a fiber is great stuff, but it’s development as a crop has been hampered by demonization of cannabis in the USA. But then you take all those used coffee grounds, extract the residual oil and make biodiesel to power your cannabis car, now that’s pretty nifty. But somehow this won’t work out because just to get enough biodiesel to drive you to the coffee shop you’d have to drink a hell of a lot of coffee, so getting enough coffee grounds to supply any meaningful amount of biodiesel just doesn’t seem feasible. Think about it. For a cross-country trip fueled by coffee you'd have to make so many pit stops, it would take forever. But let's continue this thinking; maybe the tires will be made from chocolate. Now we need some model names: the Reefer, the Roach. You'll have to help. Not enough biodiesel production yet this AM. Friday, June Oneth, and it was in the 40s this AM, so the fingers on the handle bars got really cold while riding in. But gloves? In June? And the house heat on too? This isn't Wisconsin or Maine! So May brought us record high temperatures, and temperatures so low the heat came on, just about a 40 degree F range of daily highs. May brought us a lot of June flowers pushed along by the early spring. 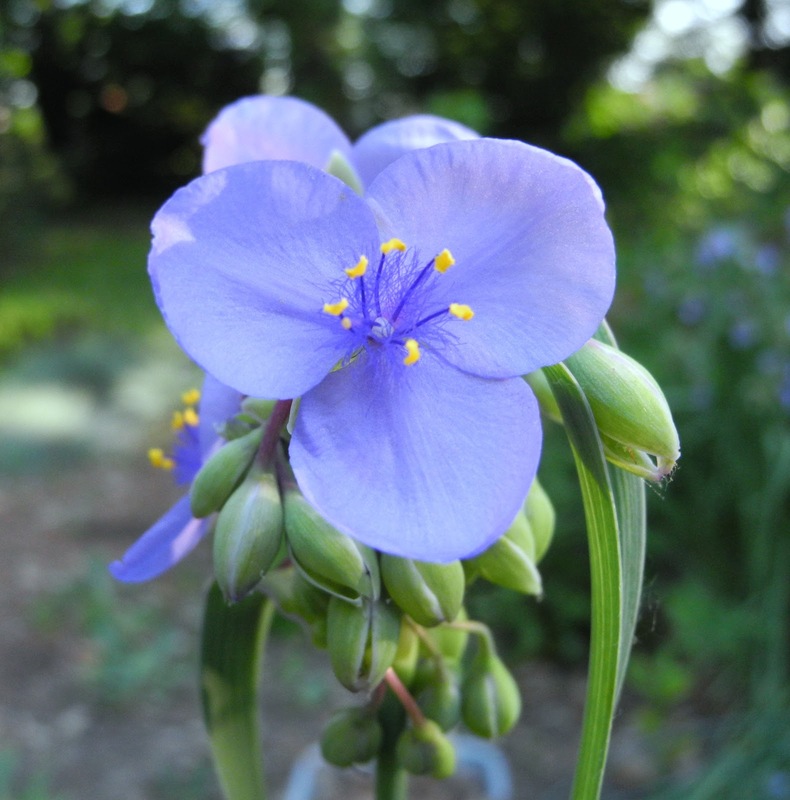 One of the Phactor's favorite plants is now flowering, here and there throughout our gardens, spiderworts, members of the genus Tradescantia. As to species, who knows? Many seem to be hybrids with T. virginiana as a parent. Several familiar house plants (Zebrina, Rhoeo) formerly placed in different genera are now treated as species of Tradescantia. Notice the little hairs on the stamen filaments. These trichomes look like strings of snap beads (remember snap beads? ), and it you have a microscope they are well worth the look both because they are pretty and because historically these are the cells in which a nucleus was observed by Robert Brown (1773-1858), and while nuclei were observed earlier by von Leeuwenhoek, it was Brown who called them the cell nucleus, and although based on a misunderstanding of how it functioned in cell biology, the term stuck. Curiously he thought that perhaps the nucleus was a feature unique to the cells of monocots. The trichome cells are also a great place to observe cytoplasmic streaming which is why species of Tradescantia are kept in our glasshouse. Lastly, for reasons unknown to the Phactor, the flower color we perceive is never the flower color recorded by either film or digital cameras. Perhaps some refraction is involved.